TADEUSZ MOLGA (born in 1955), painter, conservator and art historian, graduate of the Warsaw Academy of Fine Arts (diploma with distinction in 1986) and the Warsaw Theological Academy, member of the Association of Polish Artists and Designers. A son of a well-known artist Jan Molga (died in 2001), he was raised surrounded by paintings, in everyday contact with art. The atelier atmosphere, its specific scents and apparent disorder have been his natural environment since childhood. Completed studies of fine art history as well as conservator’s and copyist’s work of long standing helped the painter to get thoroughly acquainted with early masters’ techniques and to learn old-school easel painting. He uses these skills by creating paintings inspired by art of past ages. Proficient command of artistic skills makes him eager to take on diversified commissions. Ready to face challenges, the artist claims he can execute practically any task – from monumental wall paintings, through illusionist jokes in the convention of trompe l’oeil to images of patron saints, serving as gifts on the occasion of baptism, wedding or the First Holy Communion. 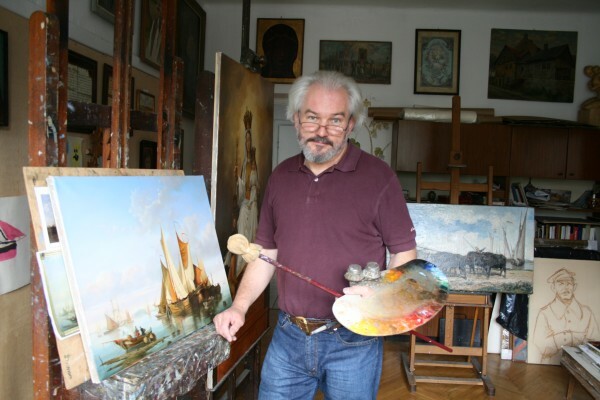 Tadeusz Molga has presented his works to the public on numerous exhibitions. His paintings can be found in museums and private collections both at home and abroad.